금귀봉의 동남쪽으로 뻗어있는 산등성이에 자리잡고 있는 무덤이다. 산등성이의 폭은 매우 좁아 겨우 1기의 무덤 정도만이 들어설 수 있는 너비이며, 양쪽 옆은 심한 경사를 이룬 깊은 계곡이어서 풍수지리학상으로 좋은 자리이다. 근처에는 고려시대와 조선시대 일반인들의 무덤들이 여기저기 흩어져 있는데, 발견 당시에는 파괴가 심하였으나 지금은 원래의 모습대로 복원되었다. 무덤 내부구조는 상자형 쌍돌덧널로 먼저 땅을 판 후 판석으로 벽을 두르고 그 안에 덧널을 설치한 굴식돌방무덤(횡혈식석실묘)으로 서쪽에 있던 덧널에는 나무로 만든 널이 1개가 들어 있었으며 동쪽 돌덧널은 비어 있었다고 한다. 양쪽 돌덧널 모두 벽면에 회칠을 하고 흑·녹·갈색으로 인물을 그린 벽화가 있고, 동쪽 돌덧널의 동쪽 벽에는 선녀 6명의 모습이 그려져 있으며, 북쪽 벽에 글자가 희미하게 나타나 있다. 서쪽 돌덧널의 서쪽 벽에는 여자 2명, 남자 1명의 얼굴이 그려져 있는 것이 확인되었다. 벽화의 내용은 악기연주 그림으로 붓의 움직임이 자유롭고 생기가 있으며, 불교의 사상이 중심이 되면서 또한 도교의 요소도 포함되어 있다. 개성 근처의 법당방에서 발견된 벽화와 함께 몇 안 되는 가치있는 고려 벽화무덤이다. 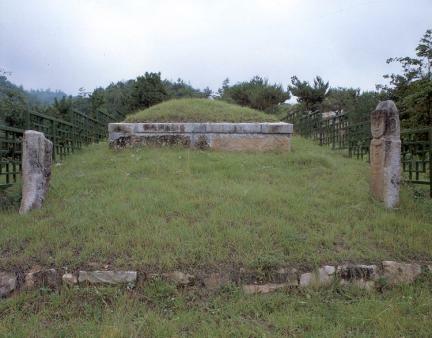 This tomb is located at the back of the mountains extending to the southeast of Geumgwibong Peak. The mountain has a very narrow width at the back, scarcely allowing space for one tomb, and has very steep and deep valleys on its both sides. The location is regarded as a propitious one according to the theory of feng shui. Some private tombs from the age of the Goryeo and Joseon Dynasties are scattered here and there nearby. They were seriously damaged when discovered, but are now restored to their original state. 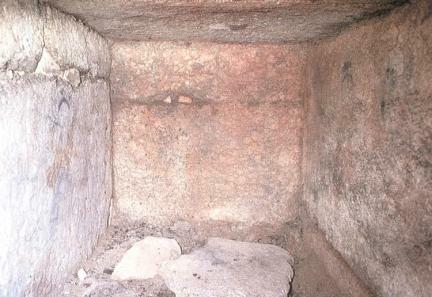 The tomb is classified as a stone chamber tomb with an inner structure of twin stone loculi built by installing chambers surrounded by stone plates inside the wall after the ground is dug out. A wooden coffin was found in the western chamber, but nothing was found in the eastern chamber. The inner walls of both chambers were plastered, and have pictures of human figures painted in black, green, and brown. 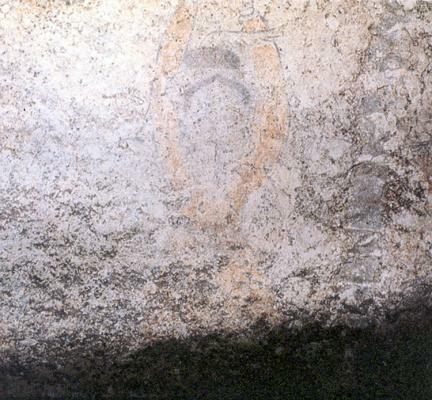 Images of six female deities were painted on the eastern wall of the eastern chamber, and a dim image of letters is visible on its northern wall. 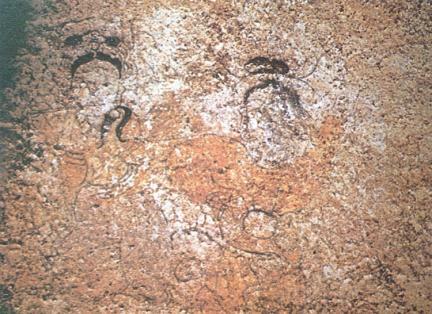 The faces of two women and one man were painted on the western wall of the western chamber. 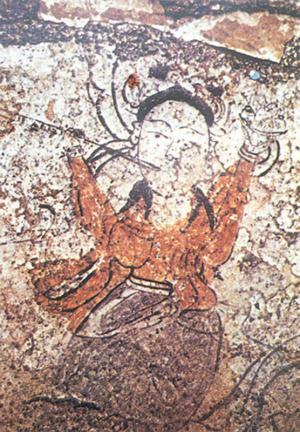 The wall paintings were mainly of musicians playing instruments, and used free and vital brush movements, with Buddhism as the main theme but also Taoism as a secondary theme. This is one of the few mural tombs surviving from the Goryeo Dynasty, with the mural found in a meditation hall near Gaeseong.